Watch cooking demos throughout the day and experience the Big Green Egg firsthand with the opportunity to do your own cooking on the Eggs! A variety of vendors will also be on hand with many kitchen and grill-related products. There is no registration fee to cook. Only registered Cooks will be admitted to the Texas Freshwater Fisheries Center by pass. General admission fees apply for entrance to the Texas Freshwater Fisheries Center Individuals will pay an additional $5 at the event entrance tent for a special wristband that allows you to taste as much as you’d like! We are so grateful to our Supporters and Sponsors for their behind-the-scene contributions to help make our Eggfest a success. Whether it is discounts at hotels, campgrounds and B&B’s, cash donations, objects for the drawing, or just individual effort, it heightens the experience and ensures a fun-filled day for everyone. NOW, TO THE PART ABOUT WHAT YOU SHOULD KNOW . . .
Every Eggfest is different. So what can you expect in Athens? Perhaps the information below will be helpful. 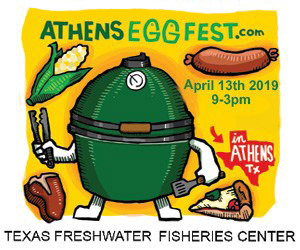 A number of those attending the Athens event are new to Egg’n and are visiting an ‘Eggfest’ for the first time. Others have been Egg’n for a long time and perhaps have been to multiple Eggfests. But just like “Newbie’s” they still want to have a good time and learn more about this wonderful cooking device, the Big Green Egg. If you bring children, be sure they are monitored closely at all times. While adults understand the heat that an Egg produces, little ones don’t always pay attention. Consider sending them over to the Angler’s Pavilion – just remember, they must be accompanied by an adult at all times. The TFFC staff will provide you with a rod and reel and turn you loose on the casting pond. First Fish certificates are handed out in recognition of this milestone. All of our guests are in for a special kind of treat. You will be expected to eat the many sample food items cooked on the Egg. We’re there for YOU. At least it seems that way when so many people are cooking all kinds of food ‘Just For You.’ You can walk around and watch how the cooks prep and cook their meals. Then you can stand there tasting samples which are happily distributed to everyone. How great is that??? If you taste something you would like to know more about, by all means ask the cook. All Eggheads love to share information. Nothing is off limits. No secrets either. We gladly share what we know and hope you will do the same. We ask that you please do not go behind the tables into the cooking areas without an invitation. Not only are the Eggs and accessories hot, but quite often the cook’s area is crowded with ice chests, cooking tools and chairs, leaving little room for visitors. We just want you to have a good time and learn as much as you can about the wonderful Big Green Egg. All of our Demo Eggs will be available for purchase following the close of the event at 4:00 p.m. on Saturday. These have been discounted substantially. A complete setup will sell for $730.00. This price includes one Large Big Green Egg, a “nest” stand, a platesetter, and a bag of charcoal. Other sizes are available for purchase as well (please refer to Buy A Demo Egg for prices). To reserve your Demo Egg, please complete and return the lower portion of the Registration Form on this blog site. A 50% deposit is required. Bear in mind that the Demo Eggs will be used throughout the day to cook food. They will be shut down at approximately 2:00 PM and allowed to cool. Be prepared to accept and transport your Egg at the end of the day. The Demo Eggs are NOT boxed and will be available for claim after 4 p.m. on Saturday, April 13th. NO EXCEPTIONS. Show your appreciation for our Sponsors and Supporters by trying and using their products. Their donations are a very strong signal that they openly support us Eggheads. Let your hotel, bed & breakfast and City of Athens know how much you enjoyed your stay. They appreciate your input. Door prize drawings for our cooks will be held throughout the day. This is our way of saying thanks to our cooks for buying the food, spending hours cooking and serving it, then cleaning up afterward. You must be registered as a Cook and actually cook food for the Eggfest to be eligible for doorprize drawings. Any cooks or vendors that wish to donate a door prize, are encouraged to contact Jim Booker at 903-670-2266. Thanks to all of you for your continued support of this event! If you have any questions you can call Rebecca Sellers at 903-670-2266.